WASHINGTON (AP) — When it comes to the public's image of John McCain, it's as if somebody dialed the electricity down in the past month. For Barack Obama, the juice is still flowing. People's regard for the Republican presidential nominee has deteriorated across-the-board since September, an Associated Press-Yahoo! News poll showed Friday, with McCain losing ground in how favorably he's seen and in a long list of personal qualities voters seek in White House contenders. Perceptions of Obama have improved or remained steady. Beyond views of the two rivals' character traits, McCain faces another problem — Obama is more trusted on the economy, the contest's commanding issue, including a 15-percentage-point edge for better grasping how the raging financial crisis is affecting people. Obama's image has been sturdy even as voters' views of the overall campaign have tumbled downhill since September. The portion of people saying the contest excites them has sunk to 32 percent while those calling it frustrating have grown to 41 percent — and in both cases, six in 10 of those whose feelings have worsened are McCain backers. Negative campaigning and a month of intense public focus on collapsing global economic and financial markets have not been kind to McCain. The new AP-Yahoo! News poll of likely voters, conducted this month by Knowledge Networks, shows more people viewing him favorably than unfavorably by just 5 percentage points, down from a 21-point difference in mid-September. During the same period, Obama went the other way, increasing a 5-percentage-point net favorable rating to 15 points. Now, Obama is seen favorably by 57 percent and McCain by 52 percent — a close margin that masks the opposite direction the two rivals' ratings are heading. "He kind of scared me," Leesa Zick, 48, an undecided Republican from Edwardsville, Ill., said of McCain's abrupt and short-lived suspension of his campaign last month during Capitol Hill talks on a financial package. "We need a president who can deal with multiple tasks. It seemed like it overwhelmed him." For McCain, the poll's good news is that despite a difficult month, his public image is not dramatically worse than Obama's and in several areas remains better. The public still rates him higher than Obama for keeping America safe, working with both political parties, and being decisive, experienced and competent. "He's more qualified than Obama, definitely, because of his experience and history, " said Richard Tosti, 67, a Republican from Rochester, N.Y.
Zick and Tosti are among about 2,000 people the AP-Yahoo! News poll has been tracking since November. By repeatedly questioning them, the survey has opened a detailed window on how individuals have reacted to the campaign's twists and turns. Less than three weeks from Election Day, Obama has taken a solid lead over McCain in most national and swing-state polls. The AP-Yahoo! 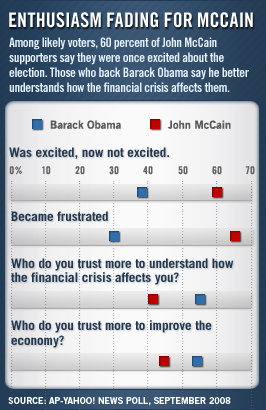 News survey underscores the morale problem McCain faces. Obama supporters are more than twice as likely to say they're excited about the race and significantly more likely to say they're interested and hopeful. McCain backers, meanwhile, more often say they feel frustrated and helpless. Underscoring a period that has seen the rival candidates trade personal attacks, about a fifth of those backing each say they're angry. "There's a lot of mudslinging, which I've never been a fan of," said Eric Juhl, 27, a Republican and McCain backer from Abilene, Kan. "And to me, the media seems pretty left-wing oriented. It's kind of frustrating." A sour public mood is typical late in presidential campaigns as both sides' attacks accumulate, said University of Wisconsin political scientist and polling authority Charles Franklin. This year's disenchantment is probably magnified by worries about how the candidates would bolster the economy, he said. Even so, Obama has staked out a clear advantage on economic concerns in the AP-Yahoo! News poll. The Illinois senator is trusted more than McCain to improve the economy by 54 percent to 44 percent, and to handle the financial crisis by 53 percent to 46 percent. Obama also has a 56 percent to 41 percent advantage for understanding how the financial crisis affects people. Unhappily for McCain, six in 10 voters who may still change their minds, about as many independents and even one in 10 McCain backers prefer Obama on that question. "To me his background indicates he'd be a little more sensitive to the middle class" in addressing economic problems, Peggy Chilton, 72, an independent from Los Angeles who hasn't decided on a candidate, said of Obama. The numbers don't get better for McCain when it comes to personal traits. Following debates between the two rivals in which the Arizona senator has appeared angry at times, 46 percent consider him hot-tempered, more than triple the 13 percent who say so about Obama. "He'd be a little nerve-racking to have in the White House, jumping real fast," Darlene Finley, 48, an Obama-leaning independent from Ossineke, Mich., said of McCain. "When you're talking about war, that's something you don't want to do, jumping real fast." Since September, McCain has lost ground on nearly every quality tested in the poll, including lower scores for being likable, decisive, honest, competent, intelligent and inspiring. He's also lost ground for understanding ordinary peoples' problems, caring about "people like you" and improving America's international standing. Growing numbers even see him as supporting big business over the public interest and being influenced by lobbyists — despite repeated vows to do exactly the opposite. Obama's ratings have stayed level since last month for most qualities tested, though he has shown some improvement in whether he's considered experienced and decisive. Paralleling McCain's problems are similar ones faced by his running mate, Sarah Palin. A month ago, more people said the Alaska governor made them more likely to vote for McCain than less likely by 14 percentage points. That gap is now down to 3 points — even as growing numbers say her Democratic counterpart, Joe Biden, makes them more inclined to support Obama. The AP-Yahoo! News poll included 841 likely voters was conducted from Oct. 3-13 and has an overall margin of sampling error of plus or minus 3.4 percentage points. Included were interviews with 373 people who initially said they were Democrats, 252 Republicans and 214 independents, for whom the margins of sampling error are plus or minus 5.1, 6.2 and 6.7 percentage points, respectively.